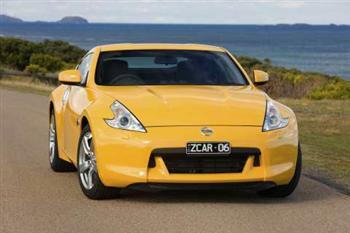 The Nissan Z sports car concept celebrates its 40th anniversary in 2009 successfully evolving the ‘less is more’ mantra. Less weight, less sheet metal. Less fuel. Less wheelbase. Less money. * But more rigidity. 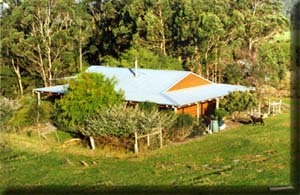 More agility. More pace. More power. More driving thrill. When the Nissan 350Z returned the famed Z badge to the Nissan line-up in February 2003 in Australia, a new era dawned. Now, after a successful run and continuous improvement over a six-year lifespan, a new Z-car is about to be released locally. The Nissan 370Z is new all over, and yet carries into the new Z generation the 'seeds' of an automotive icon and the knowledge store that made the 350Z so successful. The new body is tauter, sharper-looking and 100 mm shorter in wheelbase to bring the rear driving wheels closer to the driver. Overtly flared arches cover 18 inch wheels backed by high performance brakes. The curve of the window line is echoed in the lower sill panel, more strongly than ever, yet in the style of previous Z cars. The definitive new Z badge affixed to the front guards transforms into an indicator repeater flasher through the magical combination of LEDs and transparent smoked plastic lenses. The seats are 10 mm closer to the ground, and the driving position perfectly sited. The long bonnet hides a revised, empowered and enlarged new generation VQ37VHR high-performance 3.7 litre V6 engine that delivers an unashamedly macho 245 kW power at 7,000 rpm and 363 Nm torque at 5,200 rpm. Underlining the thoughtful evolution of the Z means the power is unleashed in a controlled, linear manner. No rush of blood, no performance jolt, but a 'muscular' surge of power that builds forcefully to a new peak of 7,000 rpm (a full 800 rpm higher than the original 206 kW 350Z from 2003). The highly advanced new VVEL (Variable Valve Event and Lift) system takes credit for delivering continually optimised valve lift and timing for deeper breathing and both low down and high-end torque. Economy is improved too, with the 370Z manual transmission model using 1.2 litres less fuel for a 100 km journey – compared to the outgoing 350Z Track coupe). Of course the VQ engine family has a success-studded record; it’s the only engine in the world to have been chosen for the ‘Ward’s 10 Best Engines’ list 14 years in a row. Matched to the new VQ37VHR engine is a choice of two gearboxes, the refined and revised six-speed manual and a new seven-speed automatic with steering wheel mounted magnesium paddle shifters. Both feature Nissan’s new and unique SynchroRev Match - the world’s first fully synchronised shift rev control system, allowing perfectly smooth up and down shifts every time… and perhaps quicker (at 0.5secs) than even a professional race driver’s heel-and-toeing. The system is switchable on the manual transmission. Downshift Rev Matching (DRM) is a feature of the new auto which delivers rapid downshifts and a matching ‘blip’ of the throttle when used in manual mode. A carbon fibre prop shaft connects with the rear axle. Wider tracks front and rear (15 mm and 55 mm respectively) further enhance stability, aided by a revised suspension that uses many more aluminium components. The bonnet, doors and tailgate are aluminium, contributing a weight saving of 32 kg. New safety systems and the new design could have added 100 kg to the overall weight, but Nissan compensated entirely for this potential additional mass by honing, simplifying and amalgamating components in order to keep the overall weight 15 kg below that of the outgoing car (manual transmission vs. 350Z Track). More power, lower centre of gravity, lower weight, wider track and a tighter turning circle add to the most complete, 2-seater Nissan sports car yet. Practicality is enhanced via a larger luggage area and increased cockpit storage. The load area can now swallow two golf bags with the deletion of the previous stabiliser strut which is replaced by a luggage partition beam. The highest point of the car is now over the windscreen not the driver’s head so the slope of the roof is an unbroken line from the header rail to the tail. Arrow-shaped xenon headlights spear the darkness, while boomerang shaped tail lights cleave a unique light form in the night. The fog lamp is centrally mounted at the lowest point of the rear diffuser, just like in Formula 1. Smart touches abound. The driver’s seat continues to focus on holding the driver firmly, now assisted by a special non-slip cloth insert surrounded by plush, black leather bolsters. The three cell instrument panel has larger gauges for greater clarity and the trim finishes are soft to the touch, conveying a premium feel. Safety is high on Nissan’s agenda so the new 370Z is one of the first Japanese cars in Australia to feature a pedestrian impact friendly ‘pop-up’ bonnet design. So thorough and painstaking has the conversion from 350Z to 370Z been that the change represents a quantum leap in automotive evolution and driving exhilaration. The new Nissan 370Z is available in Australia from this month in one specification with the option of automatic transmission. 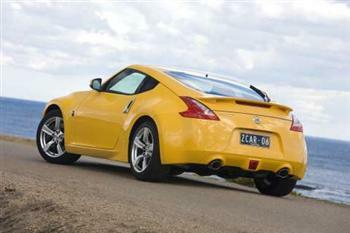 Pricing for the 2009 370Z is $67,990 (RRP) for the manual and $70,990 (RRP) for the 7 speed automatic. This means the new 370Z is actually priced below that of the outgoing, comparative 350Z Track. “The new 370Z is the culmination of Nissan’s competitive passion and its ability to create world-class sports cars,” said Dan Thompson, CEO of Nissan Australia. “The 370Z not only continues the great Z tradition but will become an icon in its own right,” Thompson said. * (370Z manual vs. 350Z Track).